Githiaski is a high-population, pre-rich water world with a billion or more sophonts in population size. It was known as Kaap Pi (Anglic: Kaap Pi) in the First Imperium. Nearly 100% of the population is composed of Githiaskio. Githiaski is a rich but metal-poor Imperial world located near the edge of the Lesser Rift, in Dartho Subsector of Antares Sector. Diameter: 8,180 miles (13,100 km). Gravity: 0.93g. Population: 2.9 billion (340,000 Human and other races, otherwise Githiaskio). Government: Representative Democracy (with powerful Technocratic/Bureaucratic elements). This world is notable as the homeworld of the Githiaskio, an aquatic Minor Race with a startling resemblance to Terran marine mollusks. 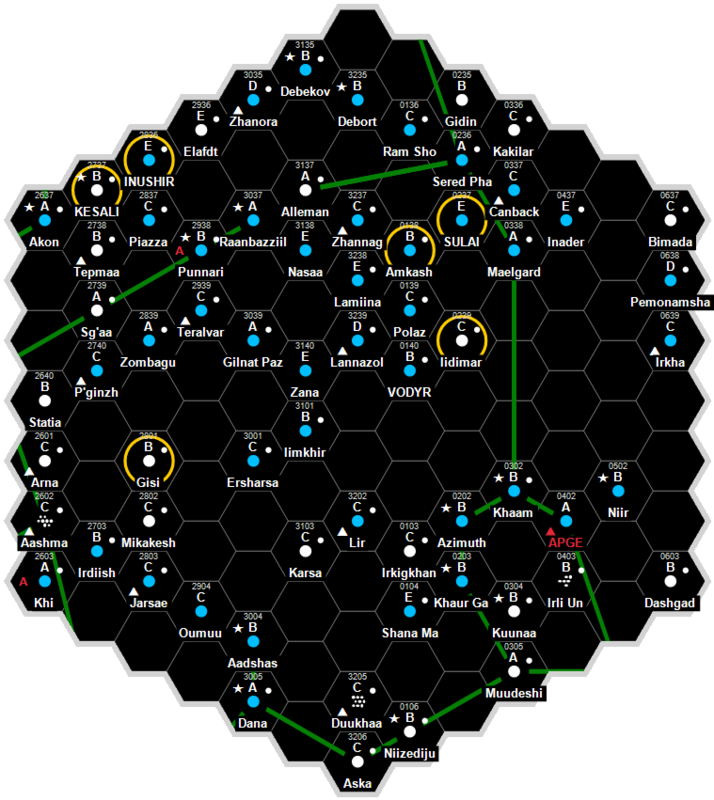 A high population world in the Dartho Subsector of the Antares Sector. Githiaski is a member of the Imperium. The world is the homeworld to the Githiaskio, a minor race. Githiaski, as a member world of the Third Imperium, holds the estate of three members of the Imperial Nobility, who are charged with overseeing the world. TBD has an excellent quality starport. TBD possesses a Technology Level of TL–12 or TL-C in Hexadecimal Notation. TBD has a Civil Service Bureaucracy government. This page was last modified on 31 July 2017, at 22:35.